NOTE: It is not legal for residents of California or Hawaii, to receive this prize due to these states' ban on ivory trade that includes fossil walrus ivory. Knife Rights is not responsible for determining legality. Winner is responsible for compliance with all state and local laws governing the receipt and possession of fossil ivory items in the winner’s jurisdiction. Click for complete rules. ABS Journeyman Smith Mardi Meshejian has crafted another of his extraordinary sole-authorship creations, this time an awesome Asian influenced knife. It has a 12.5-inch Tanto blade of his own San Mai with 1080 high carbon carbon steel clad in 17-4PH stainless steel. It has Copper guard and habaki with Fossil Walrus Ivory handle and shibuichi fittings of Silver and Copper. The handle is held in place with a Titanium pin. It is 19,5 inches overall length. A Persimmon sheath by the maker is included. Mardi Meshejian is a Journeyman Smith working in Santa Fe, New Mexico, where he exhibits his sculpture as well as his highly artistic knives. He started his career as a jeweler after earning his A.A.S. at the Fashion Institute of Technology in New York. He quickly made the switch to knife making in 1995 when he took some classes at the ABS school in Arkansas. Mardi’s knives are sculptural, with a focus on color and contrast. He likes to mix cultural influences as well as materials. Copper, titanium, fossil walrus ivory, and his own titanium damascus are among his favorites. 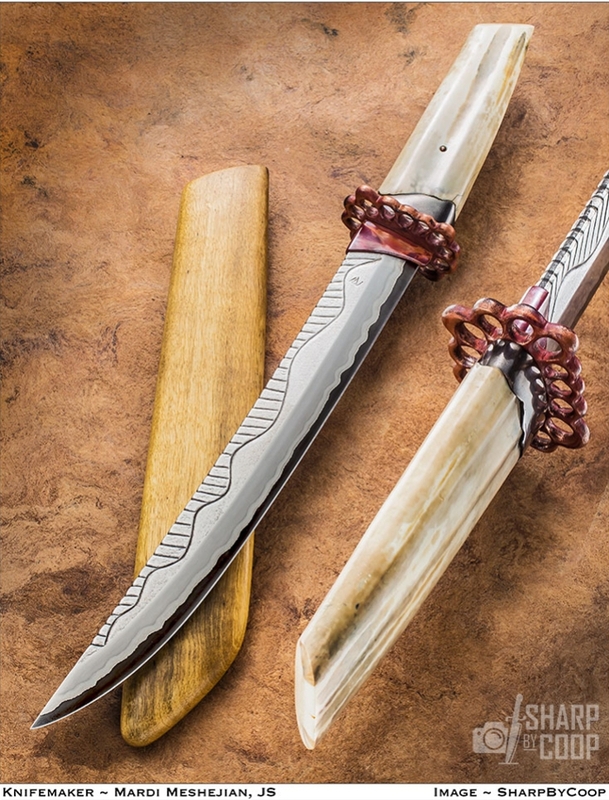 His work has an ancient yet futuristic feel and always pushes the boundaries of knife making. He is one of the true innovators of both materials and knife design. Mardi has been featured in Blade magazine, Knives illustrated, Points of interest and The Art of Modern Custom Knife. His work has been exhibited at the Historic Arkansas Museum and the National Ornamental Metal Museum in Memphis. Mardi won “Best of the Rest” at the 2011 Blade Show in Atlanta. He also won “Best Fantasy” in 2001 at Blade Show, Blade Show West, and the Blade Handmade award. To see more of his work visit www.bladegallery.com.